This can be a problem in case when there are many and/or complex dependencies. The solution is using ECMAScript modules. This will work in HTML5-compliant browsers. export and import statements are defined in ECMAScript 2015 (6th Edition, ECMA-262). module script type is available only in HTML5-compliant browsers [source]. Require.JS "modularizes" JS scripts and basically emulates import/export functionality. With ES6 modules available there is no need to use Require.JS. This is because it is NOT possible to have multiple pages with the same name in a single space. Workarounds include prepending page name with (shortened) parent page name or adding invisible Unicode characters. In my post Introduction to ESLint I followed the ESLint guide for its local installation which instructs creating its config file in node_modules/.bin. This might not be the optimal (or better to say, working) solution if we want to use ESLint plugin for VSCode. [Info - 3:18:08 PM] ESLint server stopped. [Info - 3:18:08 PM] ESLint server is running. 1. The plugin name is spelled incorrectly in an ESLint configuration file (e.g. .eslintrc). 2. If ESLint is installed globally, then make sure 'eslint-plugin-react' is installed globally as well. 3. If ESLint is installed locally, then 'eslint-plugin-react' isn't installed correctly. Consider running eslint --debug C:\dev\github\demo-html-css-js\scripts\objects_demo.js from a terminal to obtain a trace about the configuration files used. After this I re-opened project's workspace in VSCode and ESLint didn't report any errors and worked with no issues. Code linting is a type of static analysis that is frequently used to find problematic patterns or code that doesn’t adhere to certain style guidelines. ESLint community is advocating local installation although a global installation is used in the guide on ESLint's webpage [source]. NOTE: Read here why it might be better to run this command and create config file in the root directory of your project. If you choose to do so, navigate to root directory and run npx eslint --init. How to disable “unexpected console statement” in Node.js? I created a small demo app and written a short intro. Why is it necessary to install Browserify twice to bundle? When using this macro in Confluence, it is better to use filter ID rather than JQL. JQL con contain various values which can change in time e.g. the name of the fixVersion field or project name etc...If we change JQL string in JIRA we have to change it everywhere we used it in Confluence. If we use in Confluence filter ID (which is actually JQL query ID), the only place we have to make a change is JQL in JIRA - filter ID remains the same. Make sure that filter in JIRA is set to be shared e.g. with anyone logged-in. This will allow Confluence to execute filter in JIRA and display all JIRA tasks from it. Two packages have to be installed: CLI and the core one. The local installation guarantees that the project build will not break even if system install is upgraded. The global gulp install (CLI) is there only to provide a binary command in the path. Gulp is designed in a way that a specific project can depend on a specific version of the build system so it will still build no matter the state or installed version of the global package. How to check if gulp CLI is installed? In order to get the latest version we should use gulp@next. How to check Gulp version? [13:55:13] Did you forget to signal async completion? [13:55:24] Did you forget to signal async completion? --require Will require a module before running the gulpfile. package.json against the plugins blacklist. Lists all tasks defined in gulpfile. All function arguments can take arbitrary arguments. Define a function or task(s) to be executed each time any of files that matches the provided pattern change. How is Gulp actually used in projects? Projects are usually npm-based so contain packages.json. Its "scripts" section contains one or more scripts which are basically executions of Gulp tasks (in form gulp [options] tasks). 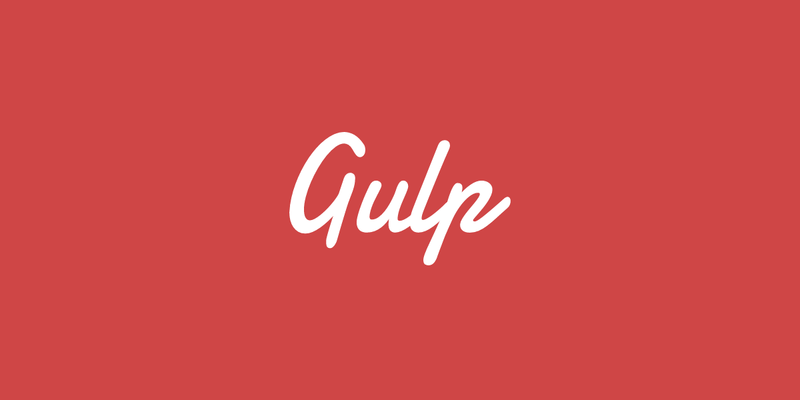 Gulp tasks are defined in gulpfile.js. Gulp is indirectly executed via npm. How do I update to Gulp 4? Why do we need Babel? It analyzes code and applies any of the transformation rules that are defined in its configuration and installed. See the full list of available presets here. If preset includes a single plugin, its name does not have to match the plugin's name e.g. preset @babel/preset-typescript includes @babel/plugin-transform-typescript plugin. .babelrc - What are `rc` files in nodejs? Obviously, if we uninstall some preset/package, we have to remove it from .babelrc. All Babel modules/packages (libraries, plugins and presets) are scoped under @babel name. Just like any other npm package, they can be installed either as a development or production dependencies. Babel command line - a tool for transpiling the code through the command line. Babel core functionality. It can be used directly in JS code via require. Plugin which transforms TypeScript into ES.next. Plugin that transforms arrow functions into ES5 compatible function expressions. A plugin that enables the re-use of Babel's injected helper code to save on codesize. But it's also required (together with @babel/runtime) when using Promise type or async-await idiom (otherwise an error like Uncaught ReferenceError: regeneratorRuntime is not defined might appear; regenrator is one of options of this plugin). Contains Babel's modular runtime helpers and a version of regenerator-runtime. Required when using Promise type and/or async-await syntax. If you try to install @babel/cli without @babel/core, npm will tell you that cli requires npm as a peer dependency. CLI acts as a plugin for Core library which makes sense. npm WARN @babel/cli@7.1.0 requires a peer of @babel/core@^7.0.0-0 but none is installed. You must install peer dependencies yourself. Successfully compiled 1 file with Babel. Output file being (almost) the same as the input file is not a surprise as we didn't specify any transformer (rules for transpilation). As in our JS file we used arrow functions, let's see how can we instruct Babel to transpile them into ES5 code. We have to install a plugin which contains rules for this transformation. We mentioned it earlier, it's @babel/plugin-transform-arrow-functions. We can instruct Babel to automatically run each time we change input files by adding option --watch to its command line arguments. Source code used in this article can be found on my GitHub account: babel-demo. Instead of installing Rollup.js globally as in the tutorial, I'll install it locally as I want to make it portable - all clones of this project will use the same Rollup version. --no-strict Don't emit a `"use strict";` in the generated modules. input: entry point - a file that imports other modules. Only single file is allowed by default. rollup-plugin-multi-entry can be used to use multiple entry points in the rollup bundle. Paths in configuration file have to be relative to the path of the Rollup executable if we call it directly. Rollup creates all directories in specified path to the output file. In this case that is: build/js. "build": "rollup -c --environment BUILD:production"
In this case we'd run npm run build and npm knows how to call locally installed dependencies (it's probably using npx under the bonnet). Let's now create a bundle script that can be loaded into an HTML file. Let's say that now instead of printing foo value into console we want to print it in HTML page. Let's define first HTML page. bundle-browser.js is a bundle output that will be created for this test. Let's create another entry point JS file which is adjusted to the web page it will be loaded into. As we now have different input and output files, we can create another Rollup config file. The content of the JS file aimed to be loaded into web page should be wrapped in the auto-executed function - therefore we have to use iife output format. Check out the source code for this demo (on my GitHub). What about TypeScript source files? We can have TypeScript file specified as an entry point. To learn how to achieve that read in this article on this blog.